The apple butter looks delicious! What a mess with the blender...it looks like something out of a horror film. I've got it in my mind to make pumpkin butter this year. 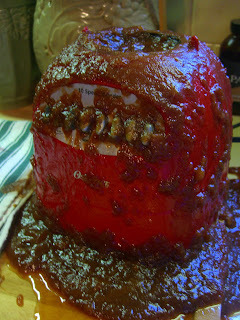 After reading your post I think that I'm going to try it in the crock pot. 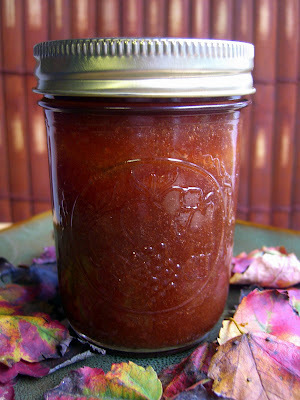 Your Apple Butter sounds yummy- I have to make it- I think perhaps half the recipe because I'll end up being the only one in my house eating it all and my hips dont need it!What do you put apple butter on besides toast? Oh gosh NO! I feel so bad about your blender!!! I'm going to have to go back to that recipe and soup up the warning about the blending. I'm so glad that it didn't burn you! I'm glad to hear that you like the apple butter at least. We've given away so many jars now that we had to make more this weekend. We can't get enough of the stuff! 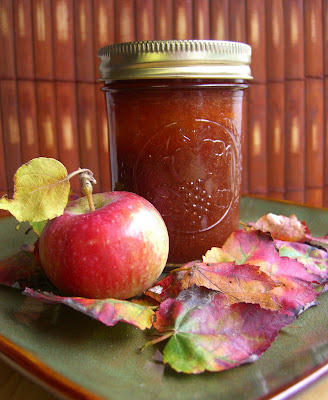 Apple butter in a crock pot? That's brilliant! You're right - the blender does look like a creepy alien. Good thing you've got such a great hubbie to clean it up for you. OMG! Yes, you're poor lil blender did look like an angry alien. So sorry it didn't survive the "experiment." MUHAHAHA! That apple butter sounds delicious. Too bad I do not have access to actual trees. I guess I'll have to replay on the local grocer, but...they won't be the same. I'm printing off that recipe. Someday, I'll have access an orchard. One can dream. Vicariously enjoying your apple butter. I bet it's delicious, thanks for sharing your trials and tribulations.